Men of the Ondo State Police Command have arrested a 42-year-old man, Benson Idowu, for allegedly cutting two of his wife's fingers for money rituals. 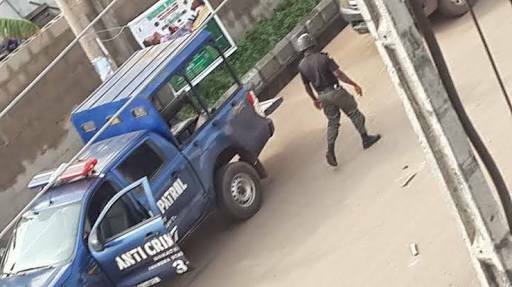 It was gathered that Benson attacked his wife, Kemi at their residence at Kardors College Street, off Akure-Owo Expressway, Oba-Ile in Akure North area on August 3 while pretending to be a hired assassin. The incident occurred about 7.30p.m. The suspect wore a mask, armed with a machete and pretended to be an assassin. He invaded his own house and attacked his wife. During the attack, the suspect was said to have informed the wife that he was sent to kill her. New Telegraph reports that he gave her a machete cut her on the head and in the process cut off two of her fingers. It was learnt that the fingers were chopped off while the wife was trying to fence off the machete from cutting off her head. The husband even asked the wife the whereabouts of her husband during the attack. Mr. Idowu was said to have gone away with his wife’s two fingers. Police source told journalists that the wife bled profusely until help came from neighbours who heard her distress call. The incident was reported at the police station by the victim and detectives swung into action only for their findings to reveal that it was an insider’s job. It was learnt the husband's phone dropped inside the room from his pocket while attacking his wife. After the attack and having fled with his wife’s fingers, the suspect later returned to the house and was reportedly searching for his telephone. The suspect was later invited and the police investigation revealed that he masterminded the attack and he confessed to the police. The state Police Public Relations Officer (PPRO), Femi Joseph, said the suspect confessed attacking his wife and blamed it on the devil. Joseph said the suspect, however, denied using the chopped off fingers for money rituals. According to him, the suspect was yet to confess where he kept his wife’s two fingers which he chopped off during the attack. The PPRO said the suspect attacked his wife with a machete and attempted to kill her. “He (the suspect) has not confessed to police detectives where he kept the fingers or what he had done with them. He kept saying it was not cut off for money ritual."